The main purpose of Unetbootin is to create an installation media. But it does not create the Ubuntu installation media properly anymore. Use Ubuntu Disks tool (gnome-disk-utility) to create the media instead. Open Disks - select Restore Disk Image from the menu on the top right. Choose the ISO file and the USB drive to write it to and start restoring. Mount the ISO file and copy the content to the USB drive. Boot from the USB drive and start to install Ubuntu. It would be more worthwhile to acquire a small flash drive and boot from there instead. Unless, of course, your BIOS does not support boot from USB. 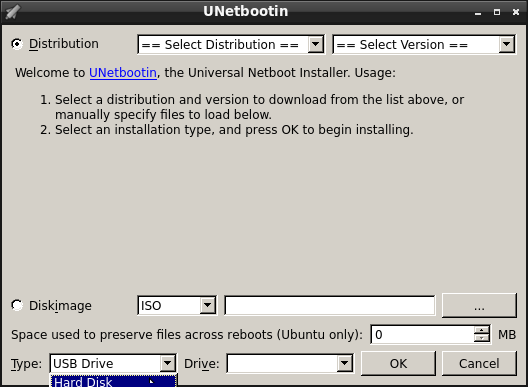 Unetbootin is designed to create "bootable Live USB drives". Within my knowledge, I do not believe it is designed to install a distro. Not the answer you're looking for? Browse other questions tagged system-installation usb hard-drive unetbootin or ask your own question. How do I install Ubuntu to another partition from Ubuntu with Unetbootin? How to install ubuntu from windows hdd (not dual boot) without cd, usb or network? Is it possible to install Ubuntu in my usb and save whatever file i want in my hard drive?